Above target - but for how long? An unexpected rise in UK inflation in November meant that a Christmas card wasn't the only thing the Chancellor received from Governor Carney at the end of last year. Headline inflation rose to 3.1%, prompting the Bank of England chief to write a letter explaining why inflation is above target. Whether the Governor has to do that again this month, after today's inflation data, largely depends on what the cost of airfares did around Christmas. Back in 2016, the price of plane tickets rose by almost 50%, the second-highest rate of monthly growth on record. We suspect the seasonal increase in airfares was more modest this year and that should help drag the headline rate of inflation back to 3%. That will be propped up slightly by a 0.7% pick-up in petrol prices, but taking that out of the mix means core CPI could slip back to 2.5% (from 2.7%), a sharper move than markets are anticipating. All of this is of course largely noise, so what next for inflation in 2018? Well, firstly it's worth remembering the spike in inflation over 2017 was almost solely down to the pound's post-Brexit plunge. 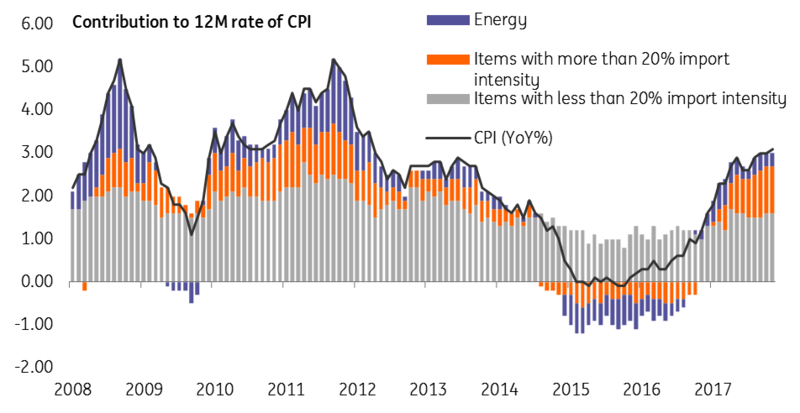 That's evident when the inflation basket is broken down by import-intensity (a rough proxy for FX sensitivity). The chart below shows when items with a greater import content are stripped away, inflation has been much more stable. Now, 18 months on from the Brexit vote and prices have more or less adjusted to the new level of the pound - or put another way, the rate of pass-through from the weaker currency has begun to slow. Audio-visual and data-processing equipment are prime examples, where both have seen the rate of inflation begin to ease and will continue doing so over coming months. Depending on how fast this slowdown progresses, we could feasibly see core inflation virtually back at the Bank of England's 2% target as early as June. Headline CPI is likely to follow suit, albeit kept a touch higher by elevated food and fuel inflation. The other way of looking at underlying inflation is to monitor wage growth, and this is something Bank of England officials have made clear will be pivotal in any rate hike decisions. And with the unemployment at the lowest level since 1975, policymakers are looking for a sharp pick-up this year. There are signs that skills shortages in certain sectors are prompting employers to boost salaries in a bid to retain staff. Bank agents have noted early signs that this year's wage-setting round (to the extent there still is one in the UK these days) is looking more positive. On the flip side, with the economy still struggling to get up to speed and raw material costs rising, some firms may continue to take a more conservative approach to wage-setting with an eye on maintaining margins. It's this latter reason that leads us to think wage growth may not pick-up quite to the extent the Bank has been pencilling in. If that is the case, then this would give the Bank of England some more breathing room and is one reason why we caution that a 2018 rate hike still isn't a given - although admittedly it will be a close call. As we noted in our monthly update, a lot still depends on Brexit, but whatever is decided, the Bank has a fairly narrow window before the summer if it wants to squeeze in a rate rise. The likelihood of a period of noisy negotiations ahead of October's European Council Summit (the deadline for a Brexit deal to be concluded before ratification) leaves February, or more likely May, as potential months for a rate hike this year.